We will be planting trees along the hillside overlooking the pool to replace the trees lost to the Purple Line construction. We are also looking into addition steps to ensure privacy for patrons along that border. These are first steps in our efforts to address the impacts of the Purple Line construction. We appreciate Board Member Jane Ward for coordinating efforts. The State of Maryland has made an offer to the Association to buy a small portion of land adjacent to the Capitol Crescent Trail and to obtain a temporary easement to use pool property next to the trail access point on Grubb Road during the construction of the Purple Line. The formal offer and negotiations to get to this point will be discussed at the Annual Meeting on Labor Day, Monday, September 5 at 4:00p.m. Full Members will have an opportunity to vote to sell the property in September. 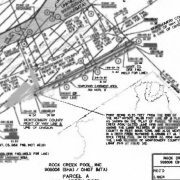 Documents related to the proposed sale of a portion of Rock Creek Pool property for the Purple Line can be found here.